Approximately 12-15 million Americans suffer from Peripheral Arterial Disease (PAD), often referred to as hardening of the arteries or atherosclerosis. 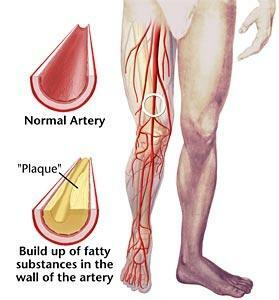 This narrowing of the blood vessels in the legs is caused by the buildup of fatty plaque and is a strong predictor of heart disease. Peripheral Arterial Disease may show up in leg arteries before there are any signs or symptoms. Many people experience discomfort while walking that is relieved by rest, but are unaware that it is due to blocked arteries. Arteries become narrowed and blood flow decreases in atherosclerosis. It is a condition in which the large and medium sized arteries supplying blood to the lower extremities become narrowed or clogged, slowing or stopping the flow of blood. The effects of this condition not only cause pain, disability and put limbs at risk, it is also one of the strongest risk markers available for predicting heart disease. Individuals with Peripheral Arterial Disease are at a four-fold increased risk of heart attack and a two to three-fold greater risk for stroke, compared to individuals of the same age without PAD. A painless, quick and non-invasive Ankle Brachial Index (ABI index) test is performed using blood pressure cuffs on the arms and ankles. The ABI index is a ratio between the pressures in your arms and legs and will identify most cases of Peripheral Arterial Disease.